Although POP3 is an old email access mechanism, many people are still using it. POP3 has been superseded by the newer and better IMAP4 protocol, and you should consider moving to IMAP, especially if you will be accessing email using multiple email clients. IMAP4 leaves your email on the email server where it is available to use from any location, and any client. One of the biggest obstacles most people face when considering changing from POP3 access to IMAP4 is what happens to their old email messages and contacts. Configure a new account but with IMAP4 Access. Important Note: the account uses the same mailbox name, email address and password. Disable the POP3 account on your client. Set the new IMAP4 mailbox as the default mailbox. 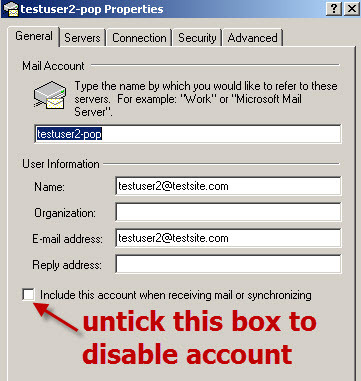 The current account for test1user@testsite.com uses POP3 to access email as shown below. 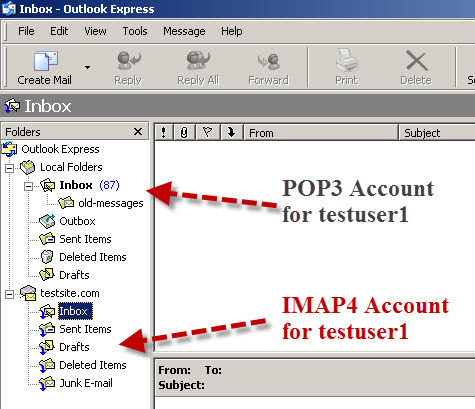 We now configure a new account for test1user@testsite.com to access the same mailbox using IMAP4. You now have two accounts configured for the same user accesing the same mailbox. To prevent new messages being received into the old POP3 mailbox you need to disable the account from the synchronisation process. 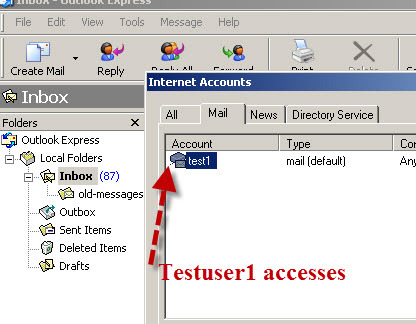 For example: On Outlook express go to Tools>accounts>select account>properties>general and un-tick the box include the account when receiving mail and synchronizing. 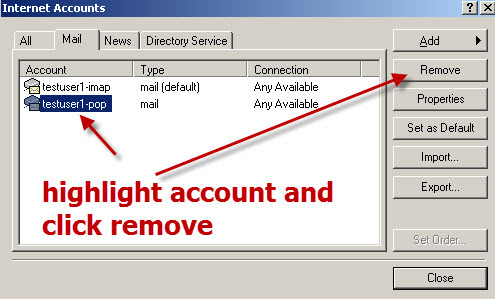 For Outlook (2003) go to Tools>options>Mail setup>send/receive Then click edit. Select account and un-tick option include the selected account in this group. Other clients should have a similar option, you may just need to search a little to find it. If you can’t disable synchronisation then you can simply change the account properties e.g. password so that it is invalid, and so synchronisation will fail. The only problem with this method is that you will get error messages when it tries to synchronise which is why it is better if you can disable it. I do both as an safeguard just in case I forget, and re-enable the account at later date. 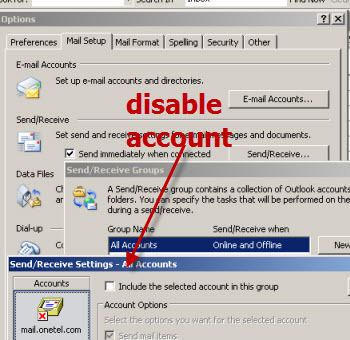 To switch to using the new account you need to set it as the default email account. Leave them in the existing Store and retain access to the store. Copy the messages to the new IMAP4 Mailbox. All of yourPOP3 messages are stored on your local PC. So providing you aren’t changing computer or email client then you can simply continue to access these messages, as they are already stored on your PC. However you cannot delete the old account. The advantage so this method if that if you move email clients or change computers in the future you wont need to worry about copying old messages. Highlight any Messages in the inbox folder and press CTRL+A to highlight all of them and press CTRL+C. Click the inbox of the new IMAP4 account to highlight it and press CTR+V to copy them to the inbox of the IMAP4 account. Repeat for the sent items and any other folders. Tip! -You can also use this opportunity to archive the old email by creating an archive folder in the IMAP4 account and moving the old email into the archive. Once the messages are in the IMAP4 folders they will be copied back to the server, and are then available to other clients. If you have copied the old messages then you can remove the old pop3 account. However I would wait a few weeks before you do this just to make sure everything is working OK.
Email contacts aren’t stored in your mailbox, and they should still be available provided you use the same email client. If you move email clients then you will need to export and import the contacts using a .csv file. Can I use the same method to copy email from a Gmail account to a Yahoo account ?– Yes this method works for all mailbox types. What Email client can I use? – Any email client that supports both POP3 and IMAP4. Do I still use SMTP to send email? – Yes IMAP4 is only used for reading email. What Happens to my Mailbox size limits? – They stay the same. The client copy method used above is the easiest way of moving from a POP3 mailbox to IMAP4. It is can is also used to copy any email account to any other email account.